This is the time for contest and it is happening at my friend’s Makoy blog.I am sure you love to join the Big Mak Blog Contest. Let me tell you, something BIG I AM EXPECTING THIS YEAR. 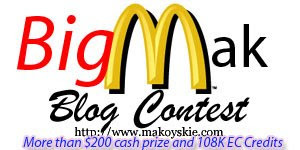 You have 11 options to earn points and raffle entries in the Big Mak Blog Contest. You can choose any of the 10 options or do all. BTW, anyone who has a blog can join especially the sponsors. If you are joining, #1 is required. If you just post the contest badge and Twitter, that is not counted.